"Education is a natural process carried out by the human individual, and is acquired not by listening to words, but by experiences in the environment. " Covington Montessori School admits students of any race, religion, national and ethnic origin to all the rights, privileges, programs, and activities generally accorded or made available to students at our school. We do not discriminate on the basis of race, religion, national or ethnic origin in administration of our educational and admissions policies, or staff. 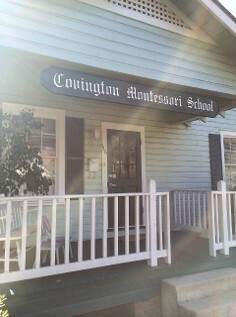 Covington Montessori School is a State Certified Montessori school in the heart of Covington, Louisiana. Our goal at Covington Montessori School is to provide quality Montessori education for children 2 years of age through Kindergarten. CMS was established in 1982 and has been successfully guiding children in the Montessori method since that time. Graduates from our first classes are now graduates of major colleges, and parents of our next generation of students. Covington Montessori School is directed by Dr. Nancy Carter, a Board Certified Pediatrician and a Certified Montessori Teacher. The staff of Covington Montessori consists of certified teachers and Montessori trained assistants with over 30 years of experience in the Montessori method. We believe that guiding our children in the Montessori method frees their potential and allows them to develop into self confident, inquisitive learners. This "love of learning" carries them into a future of unlimited possibilities. Thank you for your interest Please explore our website and contact us for more information.